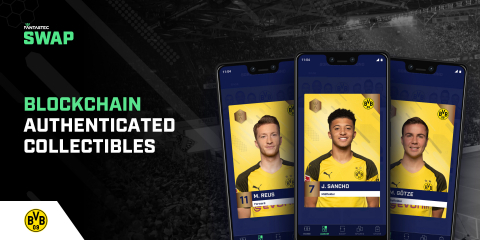 Borussia Dortmund, one of Germany’s most successful and most loved Bundesliga teams globally have joined the innovative Fantastec SWAP digital collectibles platform. The ground-breaking app allows fans to discover, collect and swap officially licensed club content such as player autographs and exclusive video from their favourite football teams. The genuine player profiles are timestamped and authenticated via cutting-edge blockchain technology. “Given our fan first mentality at Fantastec we had to have this unique product available to one of Europe’s most passionate fan base. The exceptional nature of Fantastec SWAP is it allows football fans to SWAP with confidence and trust with any fan around the world. The innovative format provides exclusive player profiles containing a variety of special features including authenticated player signatures, one-off content and dynamic stats. We are certain the thousands already playing SWAP across 50+ countries will love having Borussia Dortmund on our platform,” commented Steve Madincea, Fantastec’s Managing Partner. Fantastec SWAP encourages fans to build their squad collections through in-app team packs, and by swapping with other fans all over the world. The blockchain-powered platform offers social network-like features, enabling fans to connect and swap their collectibles with the same confidence and trust they would have if they were interacting physically. Available throughout the world via the App and Android stores, SWAP is the first product from technology-led fan-engagement company Fantastec Sports Technology Ltd. In February, Fantastec SWAP launched with Arsenal FC of the Premier League and plans to add more top football teams during the coming months. The London-based start-up uses new and emerging technologies such as OTT VOD, VR / AR, wearable tech, AI and the blockchain to connect sports fans with the sports they are passionate about. Fantastec’s mission is to enable globally distanced fans to engage more deeply with the sports, teams and athletes they love.